Today I am going to toot my own horn; toot, toot! I made, I kid you not, the best tacos ever! I took the classic taco recipe and made a few changes that takes classic tacos up another level. This my friend is restaurant quality tacos! I am so overly impressed I can’t even believe it. I normally will eat two tacos and today I ate 3 and really debated about 4! I did use a little self-control, but not much. I am just so excited to share this recipe for you. 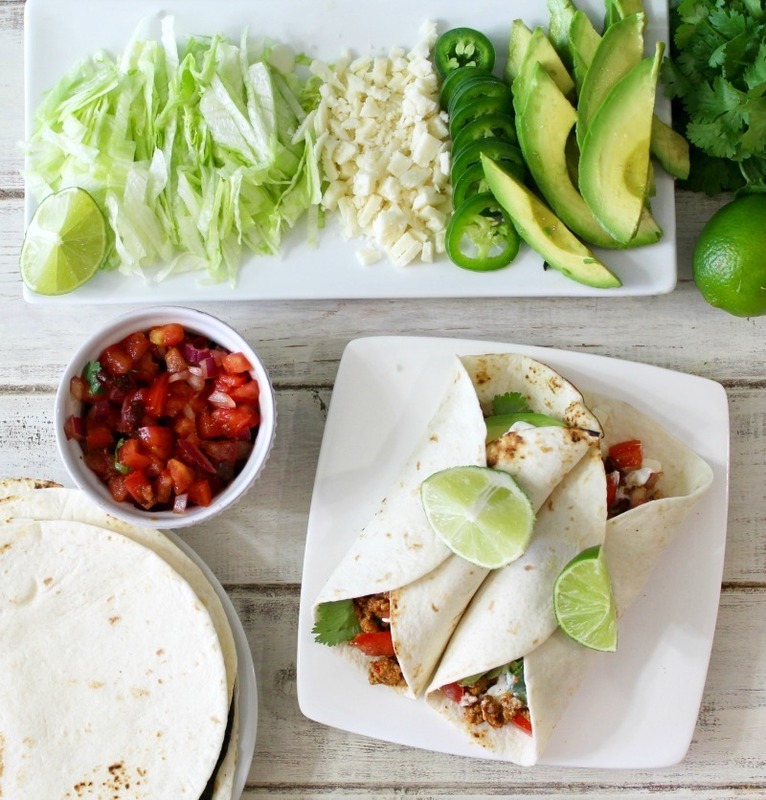 Now you can make gourmet tacos at home that will impress the taco lovers in your life! 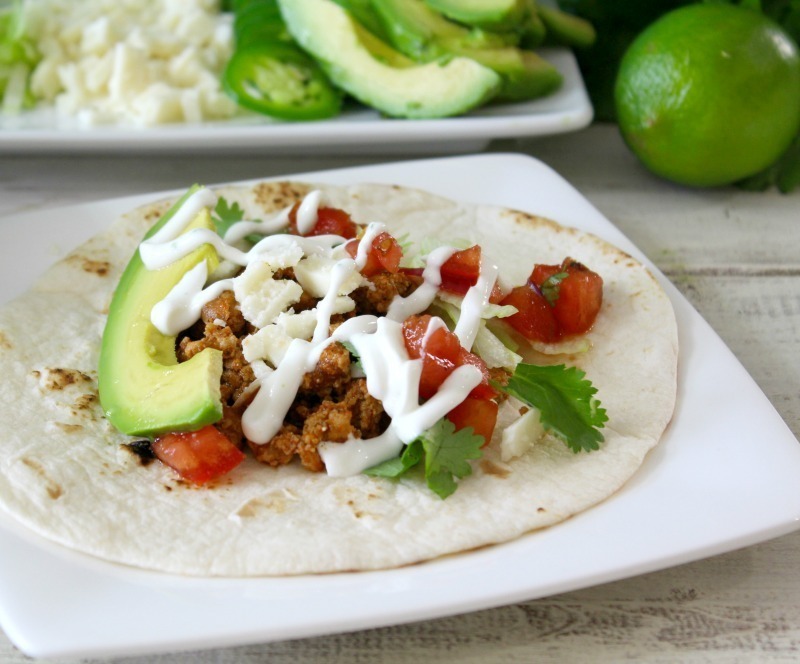 Today I have for you Turkey Street Tacos. Sigh… Just looking at the pictures above. The tacos are all gone, every last one got eaten. That saddens me. However, now I can make them at home all the time. In less than 30 minutes you can have blow your mind tacos that not only tastes good, but are good for you too! Talk about guilt-free. The flavor of the tacos are just so darn delicious. They have a kick of heat from chipotle but is cooled by Mexican Crema, which is a sour cream and lime mixture. I topped the tacos with iceberg lettuce for crunch and after-all this is California, I had to include avocado. Plus the star of the show, Foster Farms Organic Ground Turkey. Wait till I show you how I made this yummy dinner. The first thing I did was make my own taco seasoning. I used chipotle chili powder, garlic powder, onion powder, crushed red pepper flakes, dried oregano, paprika, ground cumin, sea salt, and black pepper. It is so easy and has so much more flavor than store-bought seasoning, but feel free to use your favorite taco seasoning. For the meat I used Foster Farms Organic Ground Turkey. I love Foster Farms Organic Ground Turkey because it nutritious and lean source of protein with only 160 calorie per 4 oz. Plus my favorite part is that it does not contain any antibiotics and the turkeys are raised free-range on organic land and is only fed an organic vegetarian diet. Plus 100% natural with no hormones or steroids. To boot, I love to support local businesses and Foster Farms is located in California’s Central Valley. All the good things that is California. Here is my cooked Foster Farms Organic Ground Turkey. You can see the homemade seasoning in my turkey meat. To give my Turkey Street Tacos the extra love, I took the basic condiments and jazzed them up. The first thing I did was make the Chipotle Pico de Gallo. This is a simple combination of tomatoes, red onion, red wine vinegar, chipotle in adobo sauce and cilantro. This topping has just the right amount of heat that you do not need to add hot sauce to the tacos. Plus I used tomatoes from my garden. Can you believe they are still growing? I’ll need to pull it out soon. I also made a simple Mexican Crema, which is a light sour cream that is mixed with lime zest, lime juice and just a pinch of salt. It is so good I could just eat it with a spoon. I put it in a baggie so I can drizzle it over my tacos. 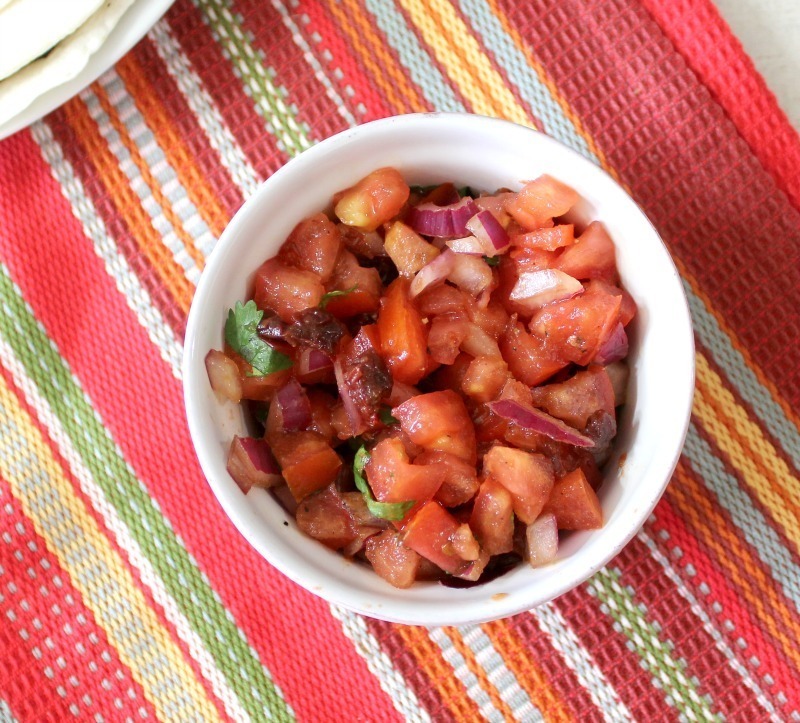 The Mexican Crema and Chipotle Pico de Gallo can be made in advance and will last up to 2 days. To give it the Street Taco feel I also charred my flour tortillas. I simply placed them on the burner of my stove and heated them over medium heat for about 15 seconds per side. You could also grill them, but this is so much quicker. Just please be careful if you do it over the stove top. 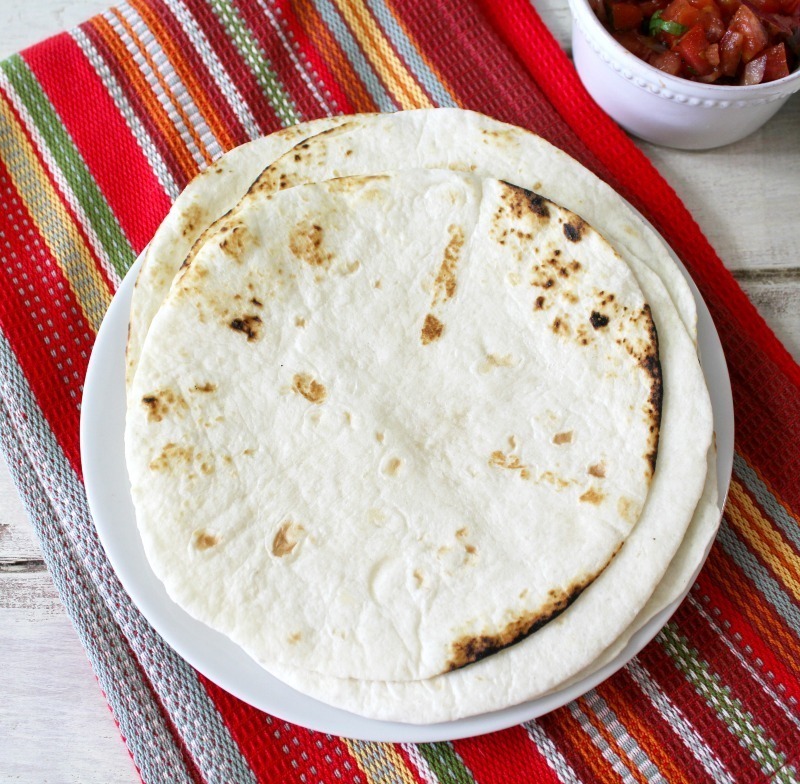 The tortillas burn quickly and could start a fire if you are not careful. I also served my Turkey Street Tacos with a few toppings. I added Iceberg Lettuce for crunch, Cotija Cheese which is robust Mexican Cheese that crumbles perfectly on tacos, plus an avocado. 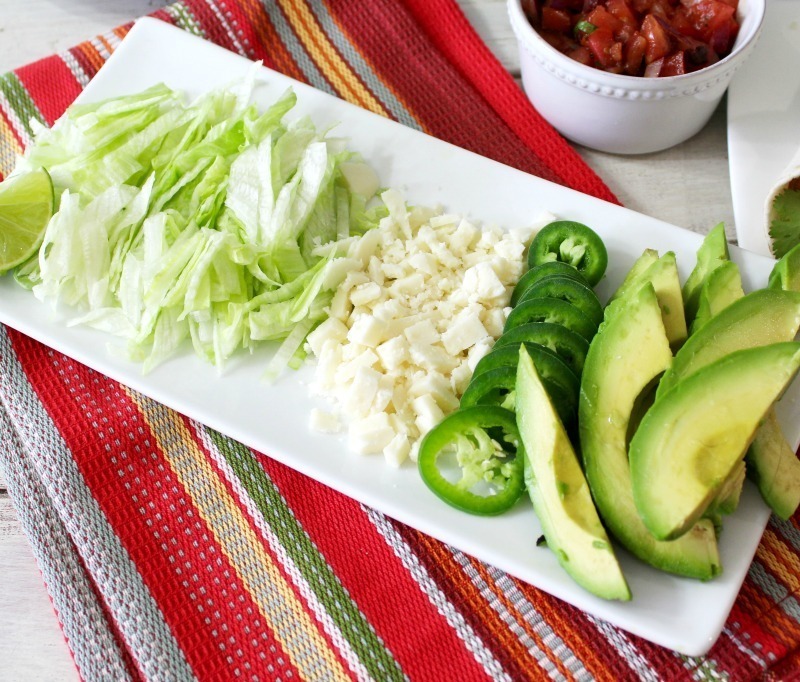 I love sliced avocados on tacos, it gives it a nice rich, creamy taste. I served freshly sliced jalapenos with it, but I actually didn’t feel the need to use them. I know, crazy, me missing out on peppers. But truly less is more with these tasty tacos. This is such a great meal and is truly part of my California lifestyle. It is filling, made with natural and authentic ingredients and makes me happy when I eat it. 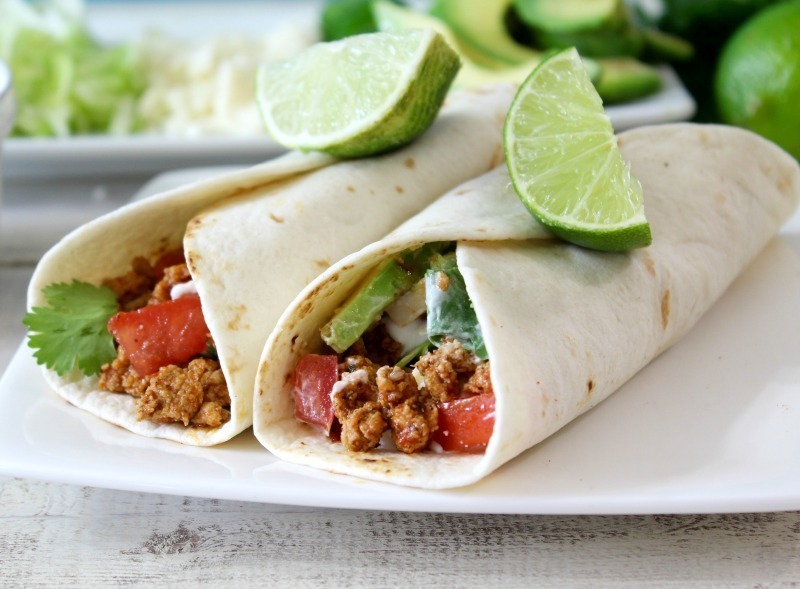 I love that I used Foster Farms Organic Ground Turkey, because it is low-fat, low-calorie and is amazing made as taco meat. When I think California food, I think Mexican, tacos and avocados. To me that is California cuisine and so is today’s recipe. My Husband who does not have the same taste in food as me, said he loved the tacos. I asked the magic question, would you eat these again? He said Yup! Score! I got another one that will be saved in the recipe box for the family to enjoy. 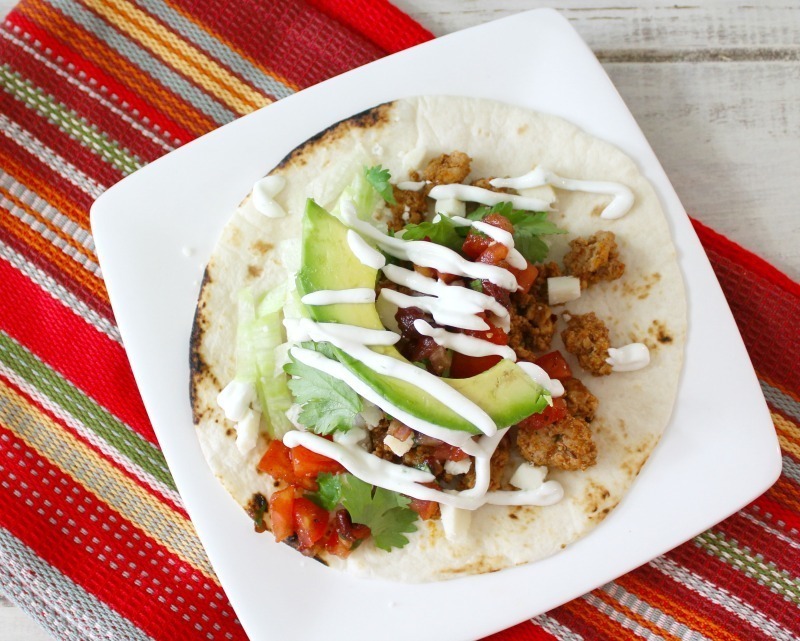 A quick, under 30 minutes gourmet taco dinner that is made with a slightly spicy ground turkey that is topped with a homemade Chipotle Pico de gallo and easy to make Mexican Crema, plus avocado, cotija cheese which is served on slightly charred tortilla shell. To Make Taco Seasoning - In a small bowl; add all of the herbs and spices; mix until combined (or you can use 2 tablespoons of taco seasoning); set aside. 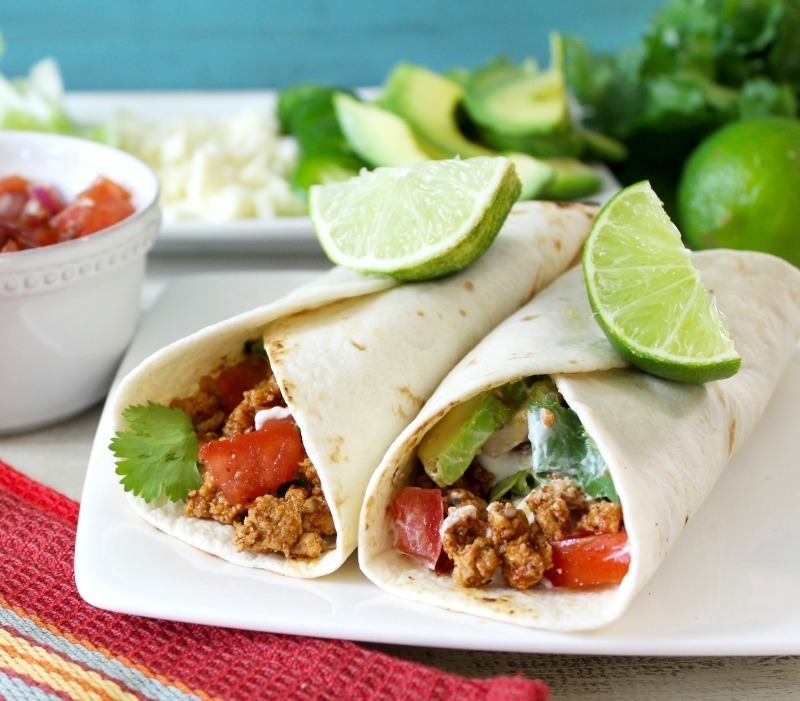 Taco Meat - In a large skillet, add Foster Farms Organic Ground Turkey. Over medium heat, cook turkey until no longer pink; stirring constantly. Add taco seasoning and ¼ cup water. Cook until water is evaporated; stirring constantly. Take turkey meat off the burner; set aside. Place flour tortillas over medium heat on top of burner of the stove. With tongs, flip the tortillas after about 15 seconds. You just want to get a light char on the tortilla shells. You can also place on grill to lightly char the tortillas. Just be careful and don't walk away from the tortillas, they burn fast. To make Chipotle Pico de Gallo - in a bowl, add tomatoes, red onion, red wine vinegar, and chipotle pepper; mix until well combined. Taste test and add a pinch of salt. Mix in cilantro; set aside. To make Mexican Crema - In a bowl, add sour cream, lime zest, lime juice and salt; mix until well combined; set aside. Put tacos together - Evenly divide turkey meat between tortillas; top with Chipotle Pico de Gallo, iceberg lettuce, avocado, cojita cheese and top with Mexican Crema. You can skip making your own taco seasoning and just use store bought. You can also use corn tortillas if you like that better than flour. The Crema and Chipotle Pico de Gallo will last up to 2 days in the refrigerator. I made them in advance. This was just a fun recipe for me. I can’t get over how changing up a few simple ingredients really added so much more flavor to tacos. This will truly be my new go to recipe. 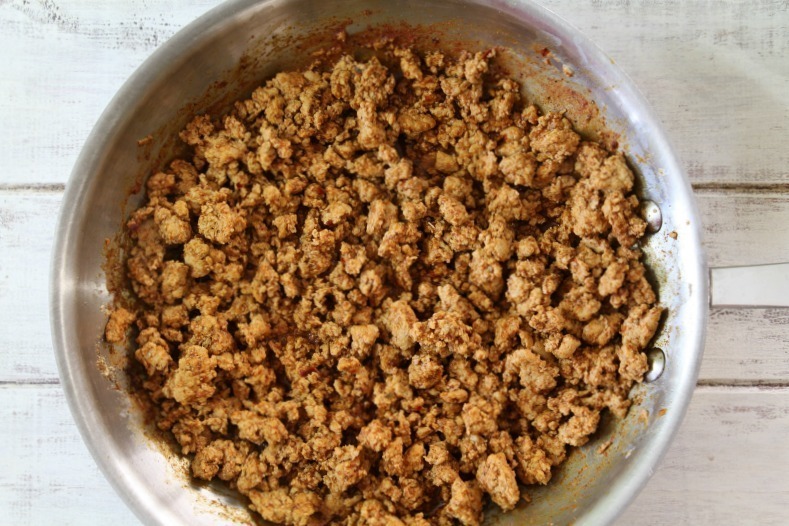 Honestly, I wasn’t sure about ground turkey? I have only used it a few times and never in tacos. 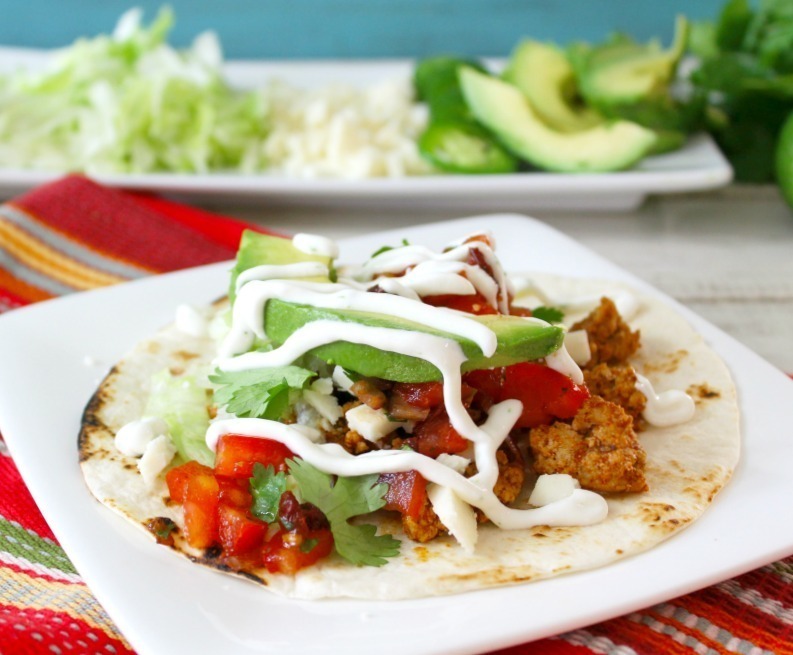 Tacos are one of my go-to easy recipes that I make all of the time and switching it to ground turkey, I wasn’t sure. But today, I am a believer! I will now always use ground turkey in place of beef. I am so happy with the taste, flavor and texture of the turkey. I am sold and so is my family. I am a happy girl! So why do I call these Street Turkey Tacos? In California there are a ton of food trucks and when you order tacos they look like these (but shhhhh mine taste better). They have simple ingredients, something you can eat with your hands and is loaded with flavor. To me, today’s Turkey Tacos are Street Tacos to me, but only better. 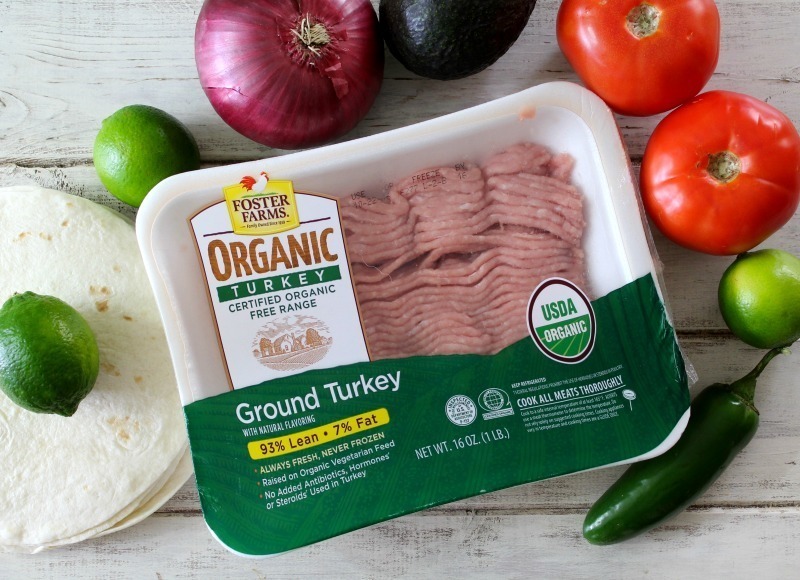 To get more information on Foster Farms Organic Ground Turkey, you can go here. This is a sponsored post from Foster Farms Organic Ground Turkey. All opinions are my own. My nine year old loved this recipe. Thanks! HI Shana, I am so glad. I really love this recipe too!